Brooke Kemper and Classified. Photos by: Andrew Ellis. Lexington, Va. – June 28, 2016 – An impressive crowd of over 1,000 spectators turned out Saturday night to see Virginian Brooke Kemper and her own Classified, a 12-year-old Holsteiner Thoroughbred gelding, take home the win in the $25,000 Grand Prix of Roanoke. The evening class was the highlight of the show that this year found a new home at the Virginia Horse Center. Kemper bested a field of 11 in the Grand Prix, emerging victorious after a four-horse jump off. Maryann Charles and FVF Sailor Man, a 10-year-old Dutch Warmblood gelding owned by Fox View Farm, were last to go in the jump off and brought home second place. The third place spot went to Tyler Smith and his own Soho D’ermisserie, a 10-year-old Selle Francais gelding. Saturday night also saw Saddlebred championships in the Coliseum. Smith Lilly took home first place in the Five-Gaited stake class aboard Blackout, owned by Ceil and Kenny Wheeler. On Friday night it was Catherine Wheeler who took home the top prize in the Five-Gaited Junior Exhibitor Championship with He’s Born to Royalty. Aimee Harrell and her own Shokoe Slip were the champions in the Show Pleasure Driving. The Roanoke Valley Horse Show is a nonprofit organization and event, and the funds raised from the annual horse show are donated to health and human service organizations in the region. Though the horse show moved outside of the area, the event will continue to benefit the Roanoke Valley and to uphold the show’s longstanding traditions of southern hospitality. Second place went to Jill Wilson and Oddsare, a 9-year-old Holsteiner gelding owned by Twin Oaks Farm LLC. Rounding out the top three was Chaz Harpman aboard MTM Bazinga an 8-year-old Dutch Warmblood gelding owned by Nina Butler. The Roanoke Valley Horse Show is an all-breed horse show offering Arabian, Hackney, hunter, jumper, racking, roadster, Saddlebred and western divisions. To learn more about the Roanoke Valley Horse Show, visit www.roanokevalleyhorseshow.com. For more information about the Virginia Horse Center, visit www.horsecenter.org. Lexington, Va. – June 7, 2016 – The historic Roanoke Valley Horse Show has found a new home in the Virginia Horse Center, and is excited for this year’s competition held from June 20-25, 2016. Highlight events during the multi-discipline event for exhibitors and spectators will include the highly anticipated $25,000 Grand Prix of Roanoke on Saturday June 25, and the $5,000 USHJA National Hunter Derby presented by Chatham Hall on Friday June 24. “We’re excited to be moving to the Virginia Horse Center because it gives us the ability to offer more classes, and it also helps our great staff of volunteers in not having to actually build a venue as we did at our previous location,” said Roanoke Valley Horse Show chairperson Stacey Wright. The Roanoke Valley Horse Show is a nonprofit organization and event, and the funds raised from the annual horse show are donated to health and human service organizations in the region. While the horse show will be moving outside of the area, the event will continue to benefit the Roanoke Valley and to uphold the show’s longstanding traditions of southern hospitality. “We are really looking forward to moving to the Virginia Horse Center and feel that it will be a great improvement in safety for our horses and our exhibitors as well,” Wright said. “It will allow us to grow our profits so we can contribute back to the charitable organizations that we support such as the Bradley Free Clinic 4-H and the Virginia Maryland Equine Program at Virginia Tech. It’s still the same great horse show, just in a new location. We are there for the benefit of the charities in the Roanoke Valley and that’s where our profits go, back to the Roanoke Valley,” Wright emphasized. The horse show is an all-breed horse show offering Arabian, Hackney, hunter, jumper, racking, roadster, Saddlebred and western divisions. To learn more about the Roanoke Valley Horse Show and supporting the event in 2016, visit www.roanokevalleyhorseshow.com. Lexington, KY – The United States Equestrian Federation Board of Directors, at its recent Annual Meeting, considered three applications for USEF Heritage Competition status. 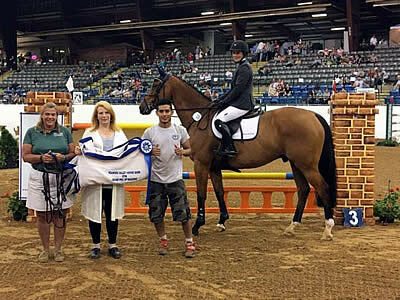 The Roanoke Valley Horse Show, the Norfolk Hunt Horse Show, and the Dressage at Devon Horse Show were granted the highest honor currently held by Federation horse shows. The designation of a USEF Heritage Competition is reserved for competitions that have been in existence for a quarter-century or more, promoted and grown equestrian sport, and made contributions to the community outside the gates of the horse show by achieving, maintaining, and promoting the equestrian ideals of sportsmanship and competition.